Try to schedule a mid-day arrival and departure to avoid arriving before your sailboat is ready. If you are a Scout group, allow sufficient time to clean your sailboat at the end of your trip. You'll be able to board your sailboat after 10:00hrs - and disembark by 10:00hrs on the day you leave. When you clear Customs and Immigration take a Minicab Taxi, costing around $25, to the marina. Our staff will have arranged to meet you there. (You'll receive more detailed arrival information by email well before your trip). Ensure you have adequate travel insurance. Label all your bags clearly, ideally with large, similar labels to avoid losing baggage. Note that hotel rooms in Marsh Harbour are in limited supply and expensive so book early if you need layover accommodations. There's a much greater choice of accommodations in Florida and rooms there will more likely appeal to a limited budget. Ensure you have parental consent forms for travel outwith the US for youth under the age of 18yrs traveling alone. Contact us if you need any additional advice or information. The following section is for guidance only and should not be relied upon without first checking with the relevant organizations or authorities responsible for entry and exit. 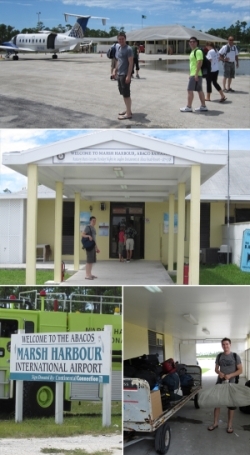 When you arrive at Marsh Harbour airport, you'll be asked to fill out an Immigration Arrival & Departure Card. You keep part of this card with your passport until your departure. When completing this form note that you're on a 'Sailing Vacation' and your address here should be c/o Conch Inn Marina. You must have a return ticket. You must have a valid passport! If you don't already have a passport, we strongly advise you to apply for one well in advance of your trip. A $15 departure tax is included on most flights. When you book your flights, check if this is included in your price. Female travelers, note that if the family name you currently use is different from the name on your passport, you must bring a copy of your marriage license. When you enter The Islands of The Bahamas, you'll be asked for a verbal baggage declaration. However, your luggage is also subject to customs inspections.